After the sweeping success of his 2006 album Like Drawing Blood, Australian singer, songwriter and drummer Gotye (born Walter De Backer) decided to take a break and put his solo career on hold for a while. He spent the next three years mainly recording and touring with Melbourne-based indie rock band The Basics, who have also enjoyed widespread success across Australia. 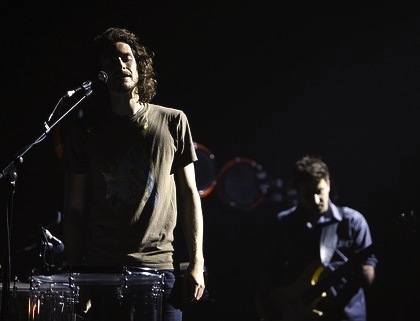 Finally, last March Gotye released his first new original song in four years, “Eyes Wide Open”, and announced that he was working on an album to be released before the end of the year. Anticipation for the new album, Making Mirrors, is at fever pitch following the release of Gotye’s heart-stopping new single “Somebody That I Used To Know (Featuring Kimbra)” which is currently the #1 most played song on Australian radio Triple J and #4 on the iTunes Singles Chart. As a bonus here’s a gorgeous ambient remix of Gotye’s 2007 hit single “Heart’s a Mess”. This re-work comes courtesy of Sydney-base electronica trio RÜFÜS, a young combo that has been making huge waves in Australia and abroad in the past few months.